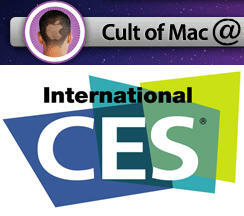 LAS VEGAS — The first piece of hardware to take advantage of the iPhone 3.0 OS’s much-heralded hardware interface has finally surfaced at CES. 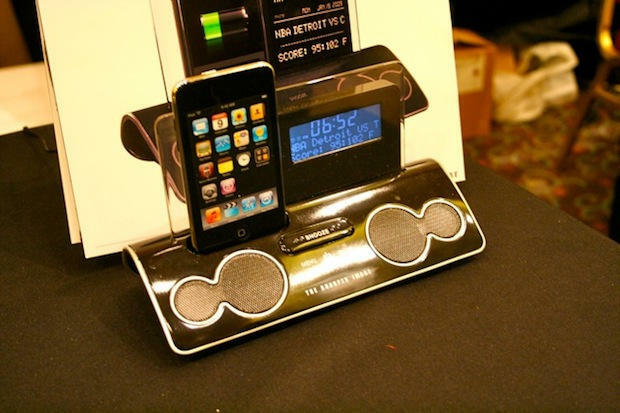 And of all things, it’s a speaker clock from Sharper Image. Back in March 2009, Apple unveiled the iPhone 3.0 OS. Executives promised a raft of innovative accessories that could directly interact with custom Apps running on the iPhone or iPt. The hardware interface would unleash crazy-cool hardware, like diabetes blood-sugar monitors. But for some reason these hardware add-ons haven’t been forthcoming. It looks like the first hardware/software combo out of the gate is a $79 Roman Clock Speaker from Sharper Image. 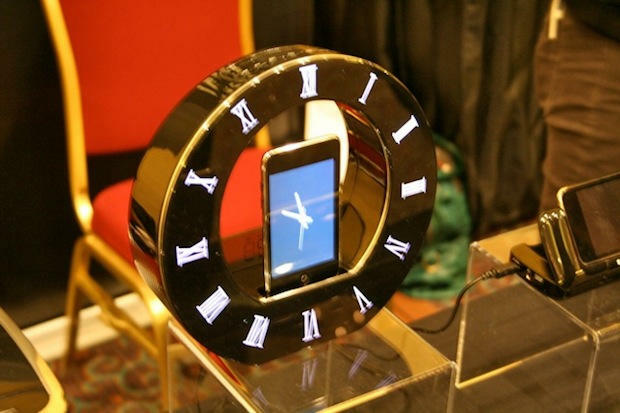 The clock featureas a custom app that displays an analog clock on the docked iPhone’s screen. “It’s the first product using the iPhone’s new hardware interface that we know of,” explained Linda Rose, Sharper Image’s VP of product development. Sharper Image is also showing off a companion Time and Weather Speaker that uses a custom app to stream information to a speaker/clock/dock, like sports scroes, stock quotes, news headlines or weather.